Each day starting today and on the run up to our event with US author and journalist Katha Pollitt, Abortion Rights Campaign will be highlighting the 8 books that are censored in Ireland. 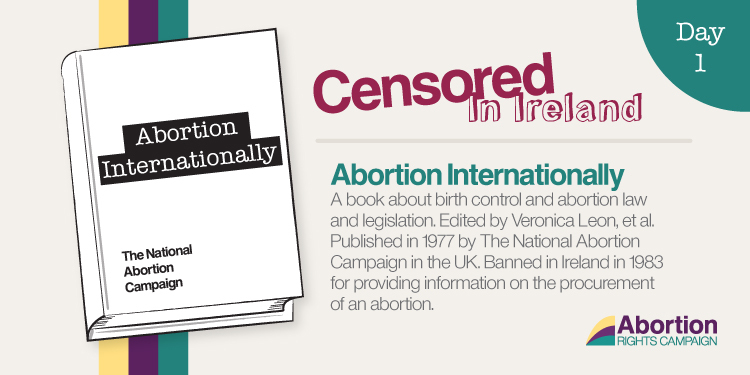 Every book that is censored in Ireland is due to content about abortion. So check back here for tomorrow’s book and let us know what you think at @freesafelegal and using #RepealThe8th or #8Books8Days hashtags. Currently there are 8 books banned by this act, the earliest book was published in 1947 and the latest in 1990. (See here) While there is provision for a Censorship of Publications Appeals Board, there is currently no member appointed to this board and no political will it seems to address the situation. Until the 8th amendment is repealed, we cannot tackle this institutionalised censorship that silences and stigmatises abortion seekers. Abortion Rights Campaign will share the title of one of these eight prohibited books per day in the run up to our event Too Loud A Silence with to counteract the silence of censorship and bust the stigma that surrounds abortion. The National Abortion Campaign was founded in 1975 as a response to a number of amendments to the UK’s 1967 Abortion Act tabled by reactionary MPs in the 1970s and 1980s. The group lobbied politicians, organised within trades unions and succeeded in mobilising thousands of people onto city streets in opposition to resticting access to abortion. In 2003 the NAC merged with the Abortion Law Reform Association to form the campaign group now known simply as Abortion Rights. Given the NAC’s proud history of direct action and struggle against the religious right’s attacks on women’s rights, it’s no surprise that their publications, which of course openly publicised the addresses of abortion clinics and other relevant family planning information, fell foul of the moral gatekeepers of Irish Censorship.